Once upon a time, an oasis was an uncharacteristically fertile area of land in an otherwise barren desert. Nowadays, if someone says the word �oasis�, most people (or at least those of us who have listened to a radio in the last ten years) will imagine two outspoken brothers from Manchester named Liam and Noel (there were three other guys in the band, but who really remembers them?). Oasis were probably the most famous of a crop of bands from the United Kingdom which were all filed under the broad category of �Britpop�. 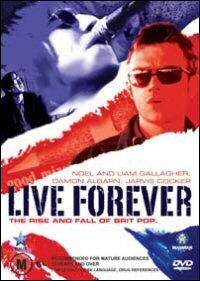 Live Forever catalogues the history of Britpop during the nineties, starting with a gargantuan Stone Roses gig at Spike Island in 1990, through the height of the �movement� during the middle of the decade (apparently the end of �Thatcherism� was the main reason for this explosion of new music � in much the same way as the punk-rock movement was a reaction to the injustices of Thatcher�s government, Britpop was supposedly a reaction to the new freedoms afforded to the British after Maggie left office), to its decline in the late nineties as the �ride� ended. All the major players are featured, with extensive interviews with Damon Albarn of Blur, Jarvis Cocker from Pulp, and some bloke named 3D(the hell?) from Massive attack. There�s also some insight offered from members of the British music media (it�s slightly annoying the way the journalists seem to assume to know the minds of the artists better than the artists themselves), and of course the Gallagher brothers. Other bands that you might expect to see included are more or less omitted, but it�s still a fairly detailed look at the music vibe in England at the time. Overall this is a great flick. The Blur/Oasis fiasco may be overplayed somewhat, but it�s a great slice of music history for anyone that�s interested in a genre of music that, for nearly a decade, was one of the biggest in the world. Brilliant. It seems that a lot of the interview/concert footage was shot on video or maybe 16mm film, and then blown up for this film�s theatrical release, so the video quality is quite grainy at times. However, for a film of this nature, a crystal-clear image isn�t really of massive importance, and the video is definitely of a good enough quality not to warrant any complaints. Um. It�s people talking. And bands playing music. British pop music. If you like British pop music from the 1990s then it�s awesome. If you don�t, then it�s utterly crap. But then if you don�t like Britpop then what in the name of arse are you doing watching this film? The extras are worth watching for the extended interview footage with the Oasis brothers, and Damon Albarn playing the Ukulele. Noel�s �tell it like it is� attitude is both amusing and refreshing, in a perverse sort of way. As obnoxious as this man may be, he certainly does make a really good point about a lot of things. In addition to the extra interviews, there�s an audio commentary track, a video diary for an Oasis tribute band called �Wonderwall� (why? ), and the usual theatrical trailer. The interviews make the extras really worth watching.